United Parcel Service began delivering medical samples via unmanned drones in and around Raleigh, N.C. on March 26, with the Federal Aviation Administration and North Carolina Department of Transportation providing oversight of the new service. NCDOT, which is working to leverage drones to expand healthcare access for the residents of North Carolina, provided oversight of first-round test flights using drone technology developed by Matternet at the WakeMed hospital/campus in August 2018 as part of the FAA’s three-year Unmanned Aircraft System Integration Pilot Program. Now UPS and Matternet are commercializing that system, according to a statement, with numerous planned daily revenue flights from the WakeMed campus into the Raleigh area. The addition of drone transport provides an option for on-demand and same-day delivery, the ability to avoid roadway delays, increase medical delivery efficiency, lower costs and improve the patient experience with potentially life-saving benefits, explained Chris Cassidy, president of global healthcare and life sciences strategy at UPS. UPS is using Matternet’s M2 quadcopter for this drone delivery service; a unit powered by a rechargeable lithium-ion battery that can carry medical payloads weighing up to about 5 pounds over distances of up to 12.5 miles. The process works as follows: A medical professional will load a secure drone container with a medical sample or specimen – such as a blood sample – at one of WakeMed’s nearby facilities. 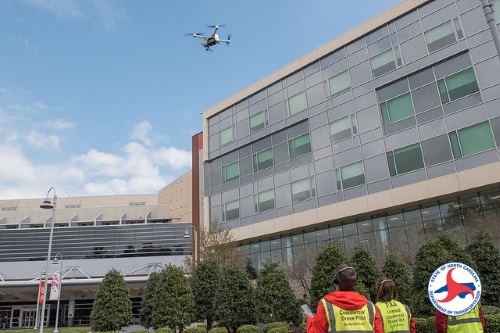 The drone then flies along a predetermined flight path, monitored by a specially trained Remote Pilot-in-Command to a fixed landing pad at WakeMed’s main hospital and central pathology lab. NCDOT, WakeMed, UPS and Matternet plan to “use the learnings” from this program to consider how drones can be applied to improve transport services at other hospitals and medical facilities across the U.S.
“North Carolina has always been a leader in aviation innovation and today is a national leader in drone safety education and use,” noted Bobby Walston, NCDOT’s director of aviation, in a statement. “We’re excited to participate in this program and leverage this emerging technology to expand access to life-saving healthcare and medicine for the people of our state and across the country,” he added.